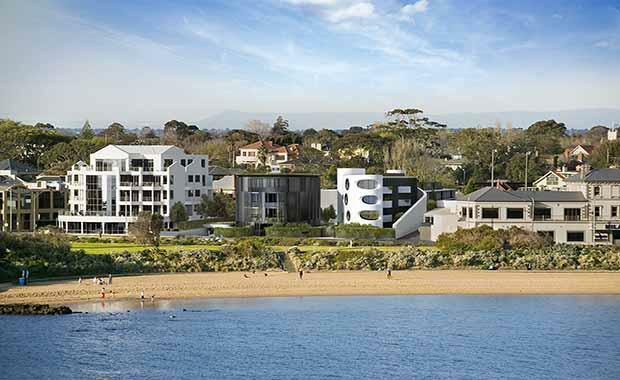 Watpac Limited yesterday announced it has been awarded a contract to build stage 1 of SC Land’s $48 million luxury Town Homes for the new 30 Esplanade development in Brighton, located 11 kilometres south-east of Melbourne. Watpac Construction Victoria State Manager, Nick Pavlovic, said 30 Esplanade fronts Port Phillip Bay and is ideally located between Middle Brighton and Brighton beaches. “Brighton is one of Melbourne’s premier bayside suburbs and we are thrilled to be involved in such a high quality residential project of architectural merit,” Mr Pavlovic said. 30 Esplanade will feature 24 luxury four-storey town homes, many with open north facing courtyards, and all including large entertaining roof gardens with northern views of the Melbourne skyline or of the bay to the south and west. Each residence has expansive 2.9m ceiling heights with floor to ceiling windows. The exteriors will feature fluted precast concrete panels, timber battens and large expanses of glass to evoke a relaxed seaside aesthetic. The boutique 30 Esplanade residential development has been designed by award-winning Melbourne architects Wood Marsh and is project managed by Charter Keck Cramer. Watpac Limited Managing Director Martin Monro said the project complements the Group’s existing portfolio in the region which includes the $85 million 26-storey STK Apartments residential tower in St Kilda, and the $60 million Leicester Street Student Accommodation project for Melbourne University and Campus Living Villages. “30 Esplanade represents the perfect combination of premium location and luxury design and we are very proud to be working with SC Land and Wood Marsh in the delivery of this project,” Mr Monro said. “The project is a welcome addition to our growing national work in hand, which now totals nearly $2 billion. Nationally, Watpac is delivering a number of major tower projects including the $206 million 180 Brisbane commercial tower and $114 million Southpoint office tower in Brisbane, and the $72 million 333 George Street office tower in the Sydney CBD. The Group recently completed its largest ever project – One Central Park – delivering five separate residential towers as part of the $600 million project in Sydney. The project was recently announced as the Best Tall Building in the World by the Council for Tall Buildings and Urban HabitatWork is scheduled for completion in September 2015.